I’ve selected the Chrome Browser to represent the segment of PC users, as its one of the most popular, secure and a regularly updated browser. No matter if you are a geek, a business executive, developer or housewife, these extension will simplify the workflow and help you do things in an organized manner. Once you read this list, do share with me your favorite productivity tools in comments section below. Some of essential steps in being productive are – capturing ideas, organizing them, work on them, and keeping your work in sync everywhere you go. 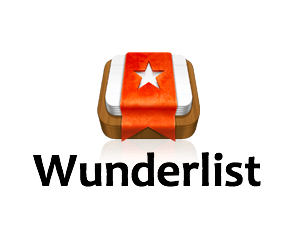 And with Wunderlist chrome extension you can do all of them at one place. With this browser extension, you can note your idea right when it strikes you and keep in sync with all of your devices like smartphone, tab, and PC. The app also reminds you, so you can make sure that all the things you’ve listed will get done in time! An amazing To-Do List maker, that has been featured in he World’s most prestigious tech blogs and news site as one of the ‘Top 10 Productivity App’, not just because its great, but it also has an outstanding user experience. You can add your To-Do items right from your browser, without having to leave your current tab, and you can organize them later with a simple to use drag and drop interface. The beauty of Any.Do relies on the Task management system, where you can create sub-tasks, attach notes, and set reminders as well. So once you get this chrome extension, your hunt for a feature-rich To-Do app is over. And yes, this one is also a multi-platform app which syncs instantly with all your devices! In a world of smart devices & even smarter apps, it is obvious that some of them are must for every productivity enthusiast. Like the Evernote for taking notes, Trello for visual organization or Team Collaboration tools like Asana. At some point in time, you’ll find yourself jumping around from an app to app, or number of tabs on a browser, which itself kills a lot of time, to do simple things like adding a note. This is where Augment comes to the rescue. Augment is a Chrome Extension that increases your Gmail functionality, by letting you add the Trello tasks, or team project information in Asana, or Evernote notes right from your mailbox. Augment not only saves your time, but makes your Gmail a powerful central management system for planning a productive day! Apart from the apps mentioned above, Augment also supports Google Calendar & you can also add file attachments directly to Dropbox without switching tabs. So make sure you try this productivity Chrome extension. Can you see those little chat boxes in following screenshots? These are not Google Hangout or anything, these are text messages right from your Gmail account. If you own an Android device, you can easily send and receive text messages right from your browser, without even having to pick up your smartphone. So this chrome extension saves a lot of time and helps you reply faster using your computer’s keyboard. Believe it or not, this is the absolute must have for any person who uses internet, as Pocket lets you save web pages for Reading them later. Many of the times we are browsing things for some work, but we come across interesting piece of content, sometimes a nice story, or a news or some enormous list of ‘100 Recipes you can Make in 5 Minutes.’ We either skip them because we are busy, assuming we will read them later sometimes. And sometimes we read them right away, wasting our work time by reading that non-urgent piece of content. So Pocket helps you be productive here, it lets you save the web pages with just a single click and you can move back to your work. The best thing about this productivity extension is, it has a Kindle like word reflow formatting, which is distraction free, and you can read all your content even when you are offline on your phone or tablet. This one is for power Google Chrome users who have at least the 9 to 10 tabs open all the times. I use way too much number of tabs than that at a time, sometimes even 35. If you are not aware, each number of open tabs consumes your computer’s memory and make your PC slower with each extra tab open. 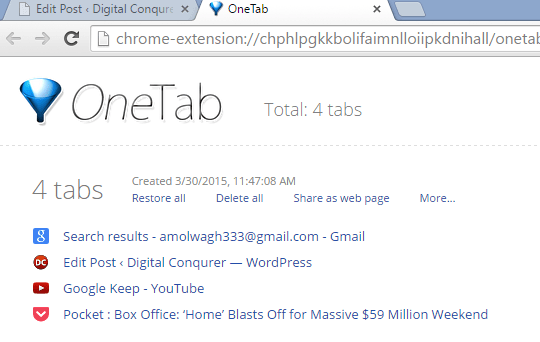 So you can use OneTab chrome extension, that will keep only one of your tab open, and collect the rest of tabs as a list, just like in the following screenshot. So now, you get a faster browsing & computing experience, and open rest of the tabs right when you need them. How often do we start our day by logging into the Facebook, or watching a viral content, or reading some useless story? Almost every day, right? We miss out work in all that time, and sometimes even a half of the day passes like that. If you are going through this cycle, one productivity Chrome extension you must have is – ‘Stay Focussed’. Just like the name suggests, it lets you stay away from the sites you browse through most, and which are non-productive. The entire suite of tools will allow you to block an entire site or particular page. And you can set a time limit on the all blocked sites. Like spend only 20 minutes a day on Facebook, and well, you will be locked out after that. This will help you focus more on work and be productive. Just like Any.Do, Google Keep will let you capture ideas, to do list, that help you remember things. But additional features like location-based reminders, that will remind you to pick up some groceries, when you are in the store, or color coding are some of the unique offerings by this productivity chrome extensions. Check out the video demonstration below! Check out the video demonstration of Google Keep! Being a Google Product its available from your Android phones to the simple desktop widget, this browser add-on will surely help you getting things done! Sometimes, we need to read things later, and we have the Pocket chrome extension for that, but sometimes we need to capture web pages, some piece of text right away from the browser. Here, the Evernote Webclipper comes in handy. Just connect it with your Evernote account ones, and it will save your content or clipped images directly to your account as the notes. ‘Save an entire page, or some specific content, save content as PDF, sharing, and finding interesting content relevant to your notes,’ are some of the most useful tools to make your web experience productive. It’s all in the name of this Chrome Extension, that we think is simple yet useful tool you can add to your productivity suite. Just save the devices to your extension, and you can send the page URL to the devices. It’s quite useful where you do not have to type the URL and then send that message to your clients, friends or colleagues. So, this is the entire list of top 10 Chrome extension that we are sure to help you increase your productivity in 2015, but we would like to know if you have any other favourites. So please share your extensions and experiences in comments section below, consider sharing this article with your friends! iOS 9- Everything You Need To Know About Apple's Upcoming OS!